Bishop Marcus has, in true, open and welcoming family style, widened his interpretation of Pope Francis’ commission to include the whole of the people of the Diocese. The Bishop sees and speaks of the Diocese of Leeds not just as a collection of parishes and schools, peopled by families but as a ‘family of families’. The most visible reflection of the Bishop’s commitment to family life is in the chapel at the Diocesan Pastoral Centre, Hinsley Hall, which he dedicated to the Holy Family at a celebration there for newly-trained Parenting Facilitators in December 2017. The Chapel of the Holy Family at Hinsley Hall, as it is now called, contains the beautiful icon of the Holy Family which was commissioned originally for the Youth Centre at Myddelton Grange. 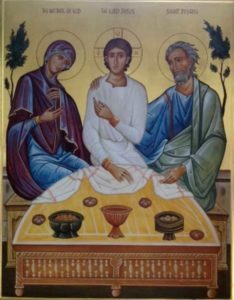 Showing Jesus as a young teen sitting at table between Mary and Joseph, the image echoes the Andrei Rublev Trinity triptych and appears to invite us to the table too. Hanging at the back of the sanctuary and connecting visually with the altar, it forms a striking theological statement or meditation on Jesus’ incarnation connecting, as it does visually, with the crucifix hanging over the altar. Those three points in the chapel form as it were the whole story: a relationship between Jesus, truly man and truly Christ, which we become part of in a special way around the table of the altar. We also go out to live this in our ordinary everyday lives, in much the same way as the Holy Family went about its ordinary everyday life before Jesus’ public ministry. The people of diocese as a ‘family of families’ are represented in many ways including events that all the family can participate in like the annual Corpus Christ procession. Families raise funds to support their young people going on pilgrimages like to Lourdes, and Walsingham and the new diocesan initiative of ‘Faith in Action’ invites the whole catholic community around a young person to guide and support them in living their faith and to commend them for their efforts and achievements as they work their way through from ‘pin’ level through bronze and silver to gold medal level. Also ‘Caritas Leeds’ brings together many diverse individual and parish charities, organisations and groups and we now have a new Pastoral Council which is intended to bring the individual parishes closer together as members of that diocesan ‘family’.